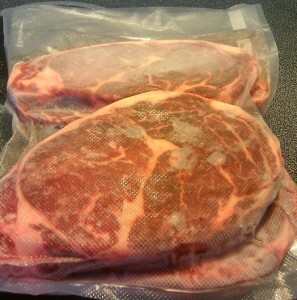 Do you thaw meat on the counter? Yeah, I know you’re not supposed to, and I understand why, but I wonder how many people disregard that ubiquitous warning. I didn’t used to thaw meat on the counter, but I’ve always been a rule-following kind of gal. Then I met my husband, who, virtuous as he is, often disregards rules, instruction manuals, warning labels, and highway signs. The only authority he recognizes is his mom. But I digress. Part of the reason I never thawed meat on the counter before I met my husband was that you don’t need to thaw what you’re not going to eat (unless you are working on a frozen Ice Age mummy). I wasn’t a vegetarian, but I lived in the middle of nowhere, didn’t have a lot of spare cash to lay in meat supplies from my sporadic trips to town, didn’t like cooking meat, and was perfectly happy to eat non-meat meals. This worked out very well, except that I developed severe iron-deficiency anemia. But again, I digress. Since I didn’t often eat meat, defrosting wasn’t much of an issue. I seem to recall sometimes having something thawing on a plate in the fridge (hard to remember for sure…anemia really takes a hit on brain function); otherwise, I cooked most stuff (e.g., hamburger meat) directly from frozen. So the whole to-thaw-on-the-counter-or-not debate never came up. But my husband is quite the carnivore. If he doesn’t get meat in a meal, he doesn’t really feel like it was a meal (except potato-leek soup in a bread bowl . . . the only vegetarian meal I’ve ever served him, and which he loved . . . but now that we’re low-carbing, that’s not something we’re likely to have very often). So once I moved in with him, I began cooking meat every day. With that kind of predictability, it’s not like it’s a surprise every evening that I have to have a big hank of something ready to cook, so if I were even moderately organized, I would always have two or three batches of meat thawing in the fridge. But, alas, that is the exception, rather than the rule. And the kinds of meats we have most often do not cook well from frozen (they usually needing some sort of trimming, for example). So I’m often in a hurry to get something thawed. Early in our relationship, I discovered that my husband is a counter thawer. I felt a little uncomfortable with this at first, but we never seemed to suffer any ill effects, and most of the time we just use the counter for part of the thawing process. Our fridge keeps things really cold, so a roast might take several days to thaw. Surely a couple of hours initially on the counter to cut down the refrigerator thawing time isn’t going to result in E. coli or other such nasties running amok on our dinner. I mean, if the slab of meat still feels cold, really cold, shouldn’t that be adequate? Government agencies and safety organizations like to issue simple, one-size-fits-all-situations rules. But is it possible that thawing on the counter might be okay under some circumstances? I started writing this post a couple of weeks ago, but a few days ago, I came across this article, which claims that the USDA says yes! Thawing on the counter is fine! It may even be safer than thawing in the fridge because counter-thawed food goes from frozen to cooked more quickly. The FDA Model Food Code (1999) recommends that food be thawed in the refrigerator or in flowing water, but provides no research to show that these methods of thawing are required to ensure safety. Thawing food, such as poultry carcasses, in the refrigerator can be inefficient and time consuming, in addition to occupying refrigeration space required for other food items. This procedure can lead to the risk of cross-contamination of ready-to-eat food stored in the refrigerator if this type of food comes in contact with the drip from the raw food. Thawing time is very unpredictable because of refrigeration temperature that may be colder than planned. On the other hand, the USDA . . . has never had restrictions on thawing at room temperature in food processing plants and allows food to be thawed in this manner. . . . The USDA is correct to allow raw meat, fish, and poultry to thaw at room temperature. There is no risk in thawing these products at room temperature. Really? Could it be that I’ve been concerned about it all these years for no reason? Well, maybe not. Despite the claims of this article, the USDA’s own website holds the same party line as the FDA: Don’t thaw on the counter. Yet I still suspect that it’s safer than the government agencies insist. Maybe I should do an experiment sometime to test the surface temperature of thawing meat. But I think common sense needs to come into play here. Thawing a roast for a few hours is probably okay. Thawing ground beef all day till it’s room temperature is probably not. I’m still going to give my husband sidelong glances when he puts together a piece of machinery without so much as a glance at its 25-page assembly manual, but maybe I can quit giving him quite as much flack about thawing meat on the counter. This entry was posted in Health, Home & Hearth. Bookmark the permalink. Kashi Strikes Again – Sunflower Seeds!